you're invited to join Cebu Blogging Summit 2015. With a theme: #CBClevelup: Cebu Bloggers 2.0 (Cebu Bloggers as Thought Leaders and Opinion Makers), the objective of this year’s Cebu Blogging Summit is to empower bloggers especially those who have been blogging for a long time to become thought leaders, social media influencers and opinion-makers. Through the event, the organizers can encourage more bloggers to be empowering online personalities in Cebu. This is a FREE event organized by the bloggers, managers and leads of Cebu Blogging Community. This year's blogging summit will be held at Century Plaza Hotel on December 12, 2015, Saturday from 10AM to 5PM. Cebu Blogging Summit 2015 is staged for bloggers and those interested to start their blog sites to be connected with other bloggers in Cebu and in the Philippines. Newbie bloggers can learn from the event the blogging ways-- from starting a blog to monetizing it to attain blogging sustainability. Resource speakers include the top bloggers of Cebu and members of Cebu Blogging Community. Invited speakers also include personalities in Philippines blogosphere and politics. Cebu Blogging Summit 2015 is presented by eStrat Media and co-presented by PLDT Home. Century Plaza Hotel on December 12, 2015, Saturday from 10AM to 5PM. Event partners: NarvasaMary.com, ExoticPhilippines.info, ChannelMarie.com, VanillaHouseWife.com, TwoWayTravels.com, KalamiCebu.com, WonderfulCebu.com, Zuprome.com, Mommywanders.com, NestedThoughts.com, Emjaefotos.com and PinoyMetroGeek.com. For more information, please visit cebubloggingcommunity.com. For inquiries, contact Bjorn Bernales at bjorn@estratmedia.com or on mobile at 0947-094-0350. 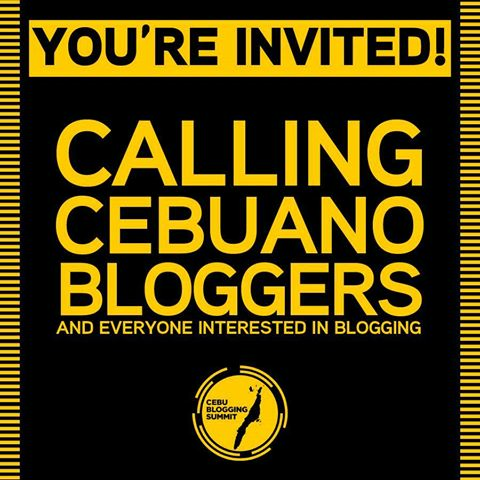 Cebu Blogging Community (CBC) is a community-driven group formed to unite bloggers in Cebu under a collective purpose. CBC aims to establish camaraderie among bloggers, improve blogging skills of members, and provide support to bloggers aspiring to reach the top of their respective niches. The community embraces social responsibility by providing great content that promotes social awareness.